Specific to Histone H4 K79 Di-methyl. 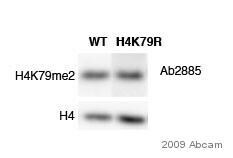 In blocking experiments, is not blocked by H3 K79 peptides. Synthetic peptide within Human Histone H4 aa 50 to the C-terminus (di methyl K79) conjugated to Keyhole Limpet Haemocyanin (KLH). The exact sequence is proprietary. Our Abpromise guarantee covers the use of ab2885 in the following tested applications. WB 1/500. Detects a band of approximately 14 kDa. Lysates/proteins at 1 µg per lane. Rabbit polyclonal to Histone H4 Di Methyl K79 at 1/500 on Calf Thymus histone prep (1 ug per lane). SKN cells were stained with ab2885 (green) at a dilution of 1/200. The cells were fixed in paraformaldehyde for 10 minutes prior to incubation with ab2885. The DNA was stained with DAPI (blue). 100x magnification. ab2885 at 1/2000 used in Western blot analysis of MCF7 cells (human breast cancer cells). Troglitazone and trichostatin increase dimethyl H4 (K79) and act as anti-proliferatives in human breast cancer. The blot was stripped and reprobed with an alpha tubilin antibody to show loading equivalence. IHC image of Histone H4 (di methyl K79) staining in human breast carcinoma FFPE section, performed on a BondTM system using the standard protocol F. The section was pre-treated using heat mediated antigen retrieval with sodium citrate buffer (pH6, epitope retrieval solution 1) for 20 mins. The section was then incubated with ab2885, 5µg/ml, for 8 mins at room temperature and detected using an HRP conjugated compact polymer system. DAB was used as the chromogen. The section was then counterstained with haematoxylin and mounted with DPX. Publishing research using ab2885? Please let us know so that we can cite the reference in this datasheet. The customer claims that ab2885 Histone H4 should detect a band of 10kDa and not 14kDa as stated on our datasheet. He says that this is not detecting H4. Can you look into to this and inform the customer please? Thank you for your query regarding ab2885. 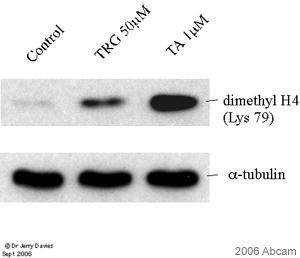 The western blot image on the datasheet was performed on purified histone preps from Calf thymus with 1 ug loading per lane (a large excess of protein). The top band relates to H3 with H2A and H2B between these and the lowest band which corresponds to H4. The MW markers on this image do appear to indicate that the H4 runs at a higher MW than would be expected but I consider this to be a fault in the resolution of these markers at the low MW range. As we did use purified histones there can be little else but H4 running at the bottom band and as the image shows this is specifically blocked by Di Me K79 H4 blocking peptide. The detection of the H3 band is probably due to the high levels of protein on the membrane. I am therefore confident that the antibody detects H4 and we shall investigate this blot with more accurate MW markers to improve the image in future. Thank you for alerting us to this and I hope that we have addressed your concerns satisfactorily.